Who's Leading the Transition to 100% Renewable Energy on Campus? America’s colleges and universities are leading the transition to a 100 percent renewable energy system. Small liberal arts colleges, large public universities and community colleges alike, from every corner of the U.S., are taking the lead in reducing energy consumption, deploying renewable energy technologies, and switching to electric vehicles. The nation’s leading campuses for clean energy — from the University of Minnesota, Morris to Southwestern University in Texas — are setting a strong example for other colleges and the nation as a whole to follow. More than 40 colleges and universities now obtain 100 percent or more of their electricity from renewable energy sources. 1 And, of the 180 schools that have reported their renewable energy data to The Association for the Advancement of Sustainability in Higher Education’s (AASHE) Sustainability Tracking, Assessment & Rating System (STARS), 91 percent are using some amount of renewable energy. Campuses are also leading in cleaning up our transportation system. Each of the top 10 schools for electric vehicles (EVs) in this ranking have switched over 60 percent of their campus-owned vehicles to EVs. Of the 261 campuses reporting their campus fleet details to STARS, 88 percent have at least one EV. Leading campuses are taking action on multiple fronts. The University of Missouri is among the leading schools for producing renewable electricity on-campus, purchasing electricity from off-campus renewable energy projects, and providing for other building energy needs — such as heating and hot water — with on-campus renewable energy sources. The University of Minnesota, Morris and Skidmore College in New York are leaders in two of these categories. America’s leading clean energy colleges and universities are setting a shining example for other schools to follow. Colleges and universities across the country should follow their lead by pledging to move toward 100 percent renewable energy. The following campuses are realizing the promise of renewable energy — installing solar panels and wind turbines on campus and purchasing power from off-campus renewable energy sources. 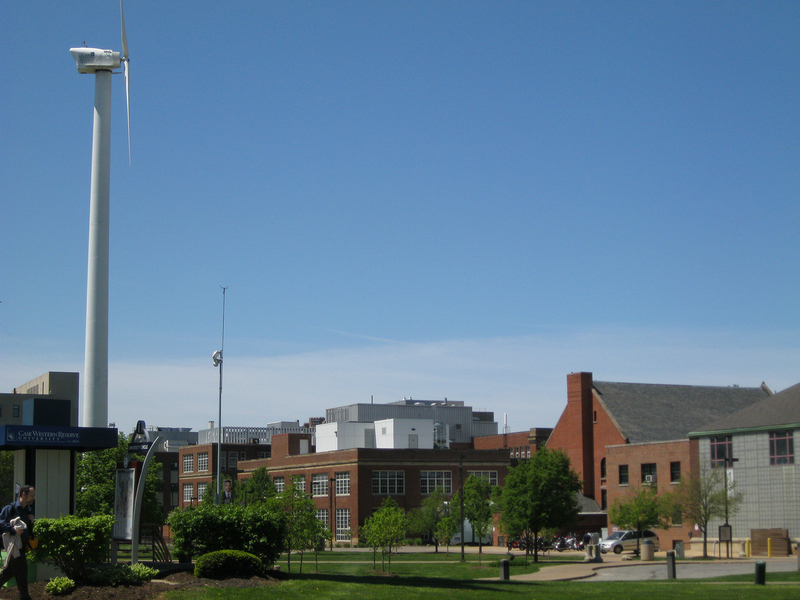 Wind Turbine at Case Western Reserve University in Cleveland, Ohio. Fryedk via Wikimedia, CC BY-SA 4.0. 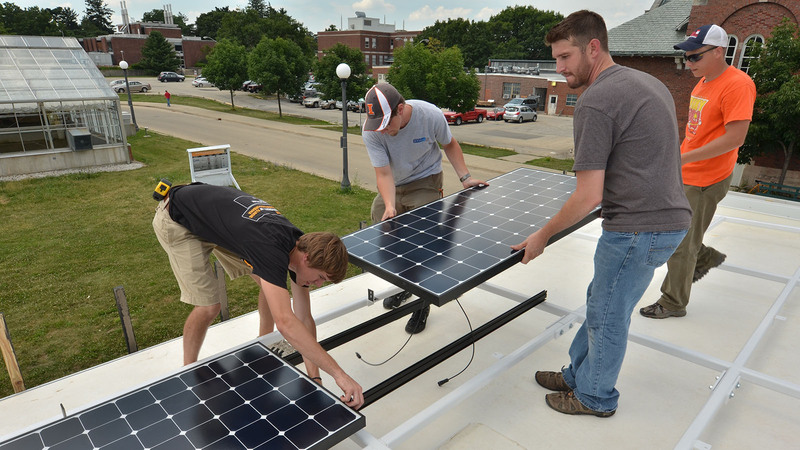 Some schools are utilizing renewable energy resources — including rooftop solar panels and wind turbines — on campus, to both meet their energy needs and provide students and faculty with valuable research opportunities. Some schools are leading the renewable energy transition by purchasing their electricity from off-campus renewable energy projects — an important option for campuses without the space or resources to make on-campus renewable energy viable. The following schools are leading on that front. Leading campuses are not just cleaning up their electricity use — they are replacing all fossil fuel-powered systems, including for heating, cooling and hot water, with systems that run on electricity or renewable energy, such as solar thermal panels and geothermal heat pumps. 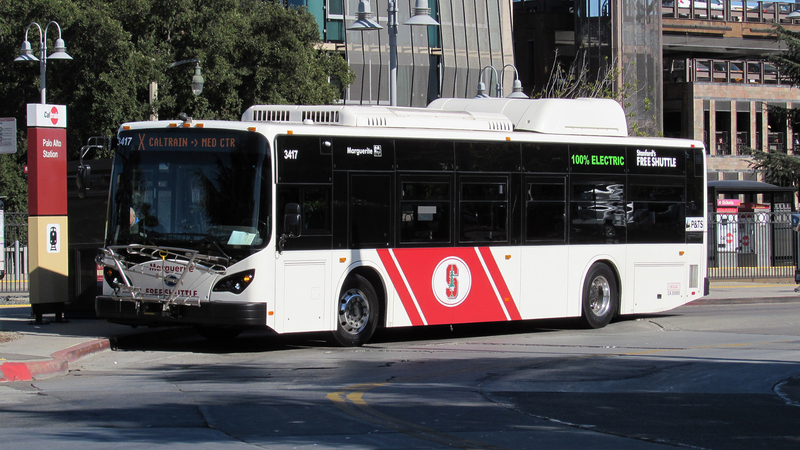 A Stanford University 100 percent electric bus. blount.photos via Flickr, CC BY-NC-ND 2.0. Leading campuses are not just cleaning up their buildings, but also their transportation systems by transitioning away from fossil fuel-powered vehicles and toward EVs. The top school in this ranking, Ringling College of Art and Design, operates 41 campus-owned vehicles, 35 of which are powered entirely by electricity. Colleges and universities are reducing energy consumption on campus to make it easier to power themselves with 100 percent renewable energy. Leading campuses are cutting their energy consumption through various energy efficiency improvements, such as adopting central control facilities that manage heating, cooling and ventilation needs in real time to prevent waste. Schools are also cutting consumption through energy conservation programs, such as initiatives that encourage students and laboratory workers to close fume hoods, which provide necessary ventilation, but can leak large amounts of energy if left open. U of Illinois at Urbana-Champaign students participate in the 2011 U.S. Dept. of Energy Solar Decathlon. stantontcady via Flickr, CC-BY-ND 2.0. Reduce energy consumption through energy efficiency improvements and energy conservation initiatives. Use renewable energy sources, such as wind and solar power, to supply 100 percent of their electricity. Transition all other building energy systems — including heating, hot water and cooling — to be electric or powered by renewable energy sources, such as solar hot water or ground-source heat pumps. Swap all fossil-fuel powered vehicles for EVs. Encourage and enable students and employees to commute to and from campus sustainably by walking, biking, taking transit or using electric vehicles. Purchase goods and services — such as food and travel — that minimize the use of fossil fuels. College campuses across the country are playing a major role in the fight to prevent the worst impacts of global warming by committing to go renewable. 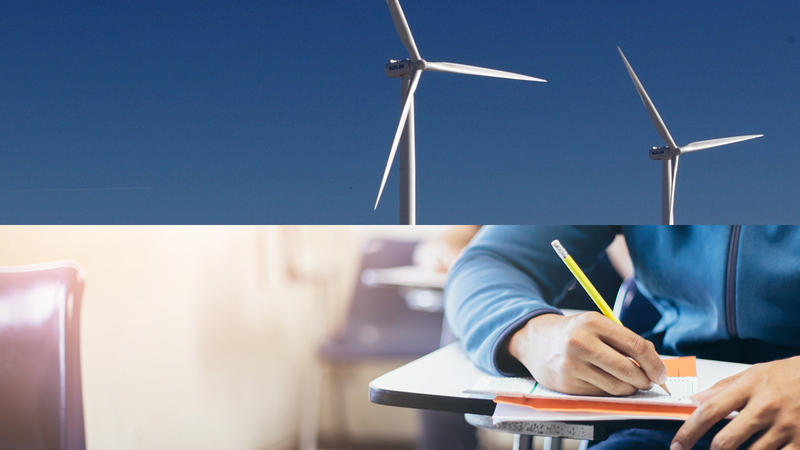 Sign our petition and add your school to join the call for 100 percent renewable energy. 1. U.S. Environmental Protection Agency (EPA), Green Power Partner List, accessed 4 March 2019, link. 2. U.S. Environmental Protection Agency (EPA), Energy Use in Commercial Buildings, accessed 19 December 2018, link; Leia Guccione and Laurie Stone, “Higher Education’s Energy Lessons: Why Universities and Colleges Are Big Believers in Campus Microgrids” (blog post), Rocky Mountain Institute, 31 October 2013, link; Association for the Advancement of Sustainability in Higher Education, How Do Campus Sustainability Initiatives Affect College Admissions?, 2 March 2009, link. 3. Princeton Review, 2019 College Hopes &amp; Worries Survey Report, downloaded 11 March 2019, link. 4. Joshua Long and Peri Kincaid, “A Red City Goes Green: The Renewable Energy Partnership of Georgetown, Texas and Southwestern University,” Sustainability, 11 December 2018, link. 5. University of Minnesota Morris, Sustainability, Renewable Energy, accessed 28 February 2019, link. 6. George Washington University, Office of Media Relations, Capital Partners Solar Project Fact Sheet, accessed on 1 March 2019, link; Association for the Advancement of Sustainability in Higher Education’s, Sustainability Tracking, Assessment &amp; Rating System, George Washington University Report, 28 February 2018. 7. Colgate University, Buildings and Land Management, accessed on 1 March 2019, link. 8. Harvard University, Harvard’s Climate Action Plan, accessed 6 February 2019, link. 9. Harvard University, Sustainability, We’re Reducing Energy Even as Demand is Growing, accessed 30 January 2019, link. 10. University of Hawai’i, Net Zero Energy by 2035, accessed 30 January 2019, link. 11. Kelli Trifonovitch, “UH Maui College Aims to be First Net-Zero UH Campus,” University of Hawai’i News, 19 March 2018, link. 12. University of California, Carbon Neutrality Initiative, accessed 13 February 2019, link. 13. Point Energy Innovations, Final Report: UC Carbon Neutral Buildings Cost Study, 23 June 2017, link.